Ever since the Fatman brand was founded in 2006, its mission has been to marry upstart digital devices such as the iPod and iPhone with vacuum tube amplifying technology, bringing both a much-needed boost in perceived audio quality to the former and some street cred to the latter - as we saw with the Fatman Mi-Tube's sibling the iTube 452. The Fatman Mi-Tube Valve Amplifier with Bluetooth, though, is arguably the smallest and neatest expression of Fatman's philosophy yet. What you get for the very reasonable UK price tag of £240 (around $380) is a 28W per channel valve amplifier with the ability to stream songs from your iPad, iPod, iPhone or other suitably-equipped mobile device using Bluetooth. 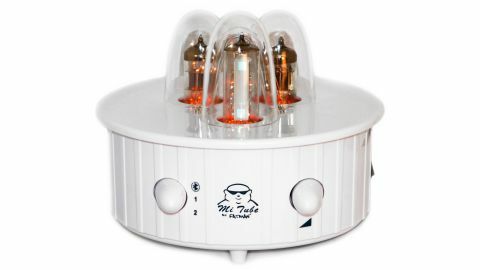 The Fatman Mi-Tube is certainly pretty to look at: viewed from the top-down it's completely circular, with a translucent covering on the top that houses discreet valves for the amp 'electronics' as well as the left and right audio channels. Plug the amp into the mains and the valves give off a warm orange glow that's almost primeval in its appeal - like gazing at the leftover embers of a bonfire when you were a kid. On the front of the main vacuum tube you'll notice a strip containing two glowing blue lights - one at the top, one at the bottom - that flicker into life when you play music through each channel. The Fatman Mi-Tube's front is pretty spare aside from two conical controls. The one on the left enables you to switch between Bluetooth streaming and the Input 1 and Input 2 RCA phono audio inputs on the amplifier's back - handy if you want to plug in a CD player or other audio source. The one on the right is a simple volume control. On the back of the amp are the two sets of analogue audio input alluded to above, plus a pair of chunky speaker binding posts so you can hook up speakers to the app using decent quality cable (some of which is supplied in the Fatman Mi-Tube's box). Getting the Fatman Mi-Tube to work with your iPod, iPhone, iPad or other Bluetooth-capable device is straightforward: you simply switch the front-mounted control dial to Bluetooth and then pair it with your device using its built-in controls, and it should all work as if by magic. The only catch is that if you walk out of range of the amp with your Bluetooth gadget in your pocket, the sound will eventually break up or stop altogether. There's another conundrum, of course: streaming low-bit rate tunes to any kind of amp will never scale the heights of audiophile delight - and there's a limit to how much a warm-sounding valve amp can do to ameliorate harsh-sounding artefacts in very compressed digital audio, or even in tunes that were badly recorded in the first place. Having said that, the Fatman Mi-Tube is a lot of fun. Feed with it high bit-rate MP3s, Apple Lossless or even CD-quality tunes and your ears will be filled with sweet-sounding vocals, melodious bass notes and an exciting, vibrant mid-range. Team that with the warm glow you'll get from those precious valves and your own feelings of satisfaction from the Fatman Mi-Tube's £240 (around $380) price tag and you'll be very happy indeed. The Fatman Mi-Tube is small, sensibly priced and beautiful to boot. The fact that it can also deliver ear-tickling audio joy (for the most part) almost feels excessive. Bluetooth audio streaming is a neat addition - as long as you accept its obvious limitations.